TAMPA, Fla. (June 26, 2017) — From the corporate world to a coffee café, Roberto Torres lives the American dream. 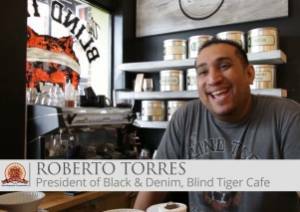 Torres is the owner of The Blind Tiger Café and Black & Denim, a clothing company. Torres is the next face in the Ybor City Development Corporation’s video web series, “Faces of Ybor.” The 2-3 minute testimonials share inspiring stories from people who thrive in Ybor City. The series includes topics on education, redevelopment, new businesses and much more. Originally from Panama, Torres lived in New York and Miami before settling in Tampa. He worked as an auditor before starting his own business in Ybor City. Torres has a second Blind Tiger location in Seminole Heights and plans to open a third in Hyde Park. The videos are produced by HCP Associates and filmed by The City of Tampa Television (CTTV). The YCDC will release about a dozen videos. The goal is to promote economic growth in Ybor City. The series is online at www.yborcityonline.com/faces-of-ybor. Ybor City Development Corp serves as the community’s liaison for economic development. Our mission is to facilitate the development and redevelopment and economic revitalization. Ybor City is a historic district in the city of Tampa. Several structures are in the National Register of Historic Places.